♥Enter into a rich fantasy world with Crow Drink Water. 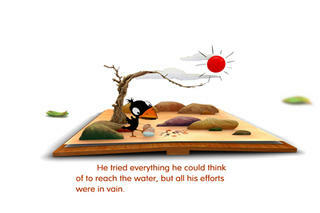 Based on the 3D eBook engine, Crow Drink Water makes further development ,such as each pop-up scene bringing the story vivid by the way of presenting simple tasks to perform, effectively taking the reader into the world of the story. 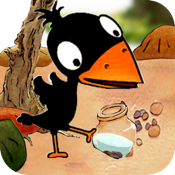 Crow drink water is amazing because of the perfect design .It is a super interactive version of the classic story. It illustrates in a so vivid pop-up style that you can interact with the story in an entirely new way. • Full 3D experience . • Wonderfully illustrated, with beautiful, colorful imagery. • 6 beautifully presented pages of text. • Read to Me, Read it Myself. • Orient the book by dragging to see the 3D pop-up scenes. • Features real person's humorous reading. • Open and close the book on the reading desk. • Highly optimized for smooth, seamless execution on all devices. • Language Support for English,Chinese. Crow Drink Water uses the new technology which enables interactive 3D pop-up scenes to be created on the pages of our 3D eBooks. It has taken pop-up books classic and updates it with modern language, fully interactive pop-up scenes ,humorous reading .